Join us in Uganda to explore a beautiful, unspoilt part of the world. To meet like-minded adventurers and mingle with the local community too. To relax in luxurious surroundings, kayak in a crater lake, rummage in African markets, meet chimps, drink cocktails as the sun goes down, float alongside hippos, and, of course, ride - a lot. The pinnacle of your trip is the main ride...100 or 200k through the Albertine Rift Valley, while Africa's highest mountain range towers above. This trip, full of special details and a lot of adventure, will be something you never ever want to forget. Tuesday 3rd December: Arrive at Entebbe Airport, transfer to Kyaninga Lodge, see details. Wednesday 4th: Relax, enjoy all the facilities at the lodge and head out on a group cycle. In the evening it's cocktail night! Saturday 7th: Ride the Rift Sportive! Evening party back at Kyaninga Lodge. Sunday 8th: In the afternoon some of the kids and families from the KCDC will come to the lodge for fun and games! Monday 9th: Transfers to the airport. The campsite has beautiful views reaching across valleys and distant villages. There is a purpose built WC and shower block on site. All meals and drinks will be at the HQ building (see map below) for all runners to enjoy together. Gadgets can also be charged in the HQ, it's a good idea to bring a battery pack too. 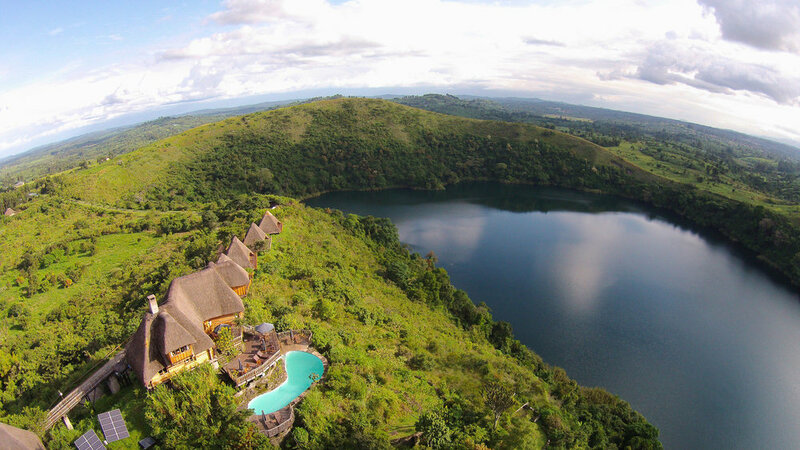 Stay in a luxury safari tent overlooking Kyaninga Crater Lake and the Rwenzori Mountains - this may be the best view you've ever woken up to. Newly built WCs and showers are awaiting you, as are lockers (with charging points inside) to keep your valuables secure. Each tent has hand-carved wooden furniture and everything you need for a luxurious and comfortable stay. Ride the Rift is from the creators of Running the Rift Marathon, also hosted at Kyaninga Lodge.